Discovery Vitality and the Reach For A Dream Foundation have joined forces to create another Dream Room for children in hospitals – with the third room opening at Chris Hani Baragwanath Paediatric Oncology Ward in Soweto, Johannesburg today. The men’s elite race was dominated by twenty-year-old Alex Yee (GBN) with a time of 00:52:04 in first place, and the women’s elite race ended with an exciting eight seconds between Ai Ueda (JPN) and Summer Rappaport (USA). Discovery Vitality today released the results of its 10-week public campaign, the Vitality Open, which was aimed at getting South Africans to exercise more and improve their driving behaviour. Today at the 2018 Discovery Leadership Summit held in Sandton, business leaders emphasised the irrefutable case for economic growth. This is central to turning around the country since the 2008 financial crisis and the challenges associated with state capture. Cape Town leads the pack in healthy living and better driving. Bringing the number of countries in which the Vitality Shared-Value Insurance model is available to 18. A panel of doctors and medical experts agree exercise is a ‘vital sign’. The night belongs to runners! Discovery Vitality encouraged by the revised sugar tax design announced by Finance Minister Pravin Gordhan in his 2017 Budget Speech. The 2017 Discovery Get Active Weekend kicked off today in perfect weather conditions. Entries are now open for the third Discovery Duathlon Cape Town and the Discovery Triathlon World Cup Cape Town. On the 11th and 12th of February, Cape Town will play host to the Discovery Duathlon Cape Town and the Discovery Triathlon World Cup Cape Town. Discovery announced that David Beckham will be addressing the Discovery Leadership Summit to be held in Sandton, Johannesburg on 14 November 2016. The Summit is a flagship, global thought-leadership event that enables the sharing of intellectual capital to contribute to leadership in business, government and civil society. 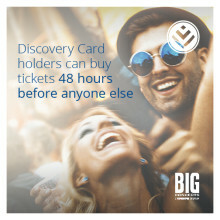 Discovery and Big Concerts today announced a strategic alliance, with Discovery Card becoming the official credit card partner of Big Concerts, South Africa’s leading concert promoter and a part of Live Nation Entertainment, with the goal of connecting fans to their favourite global artists and driving growth of international live touring in South Africa. New research by The George Institute for Global Health reveals the high and unnecessary amount of salt in instant noodles sold around the world.